I read the book after having read the others, in a reverse chronological order. 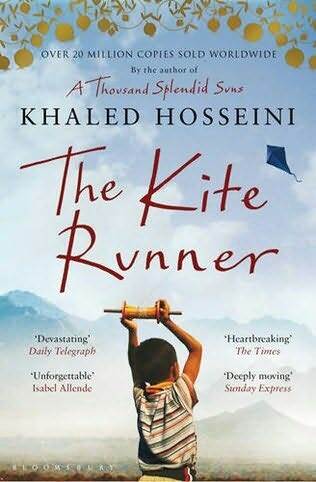 ‘The Kite Runner’, is the story of Amir, and of Hassan. It was this book which broke Khaled Hosseini’s ‘arranged marriage’ with his medical profession; he consequently moved in permanently with his ‘mistress’ - writing, to become a full time writer. Since then, he has written 2 other major Novels, ‘A Thousand Splendid Suns’ and ‘And the Mountains echoed’, each of which has earned worldwide acclaim. This one, however, is a little different. Amir grew up in Afghanistan, growing up under the towering and stoic presence of his father (whom he called ‘Baba’ and that is what we would also call him), a self-made man, bent on shaping the world the way he wanted. Baba lost his beloved wife when she was giving birth to Amir, which Amir thinks to be the reason why Baba tends to hate him, sometimes. They had a Hazara servant family, Ali, and later, his son Hassan. Hassan’s mother ran away with a gang of singers one week after she gave birth to him. Hassan and Amir were fed from the same breast. Ali used to say that “there was a brotherhood between people who had fed from the same breast, a kinship that not even time could break.” This bond is tested time and again throughout the book. Amir was timid and soft in tastes. He had a mind for literature, something that he inherited from his mother. Hassan was illiterate in books, but abundantly rich in everything else - courage, faithfulness, compassion, positivity, guilelessness. Sometimes, Amir would be jealous of him. Amir was undecided on what Hassan was to him. They played together, they went to cinema, to market, to the hilltop where, under the pomegranate tree, Amir recited Hassan the story of Shohrab and Rostam from the Shahnama; almost everything memorable done by Amir was with Hassan as his partner in crime. It was Hassan to whom Amir swindled in his first work of fiction under the garbs of reading from a book. It was Hassan’s encouragement that gave courage to Amir to approach Baba and Rahim Khan with his stories. They flew Kites together, chased kites, won the tournament together and yet, Amir did not play with Hassan when other children were around. Then, Hassan was his Rostam from the Shahnama; almost everything memorable done by Amir was with Hassan as his partner in crime. It was Hassan to whom Amir swindled in his first work of fiction under the garbs of reading from a book. It was Hassan’s encouragement that gave courage to Amir to approach Baba and Rahim Khan with his stories. They flew Kites together, chased kites, won the tournament together and yet, Amir did not play with Hassan when other children were around. Then, Hassan was his servant’s son. That was his answer. For Hassan, Amir was his only friend. This ambivalence costed Amir a huge cost - a massive guilt. The rest of the story is his journey, of being ‘good again’. The story is fresh, one read and you would know that it has to be the debut. It is that kind of fresh! It has the untarnished fragrance of a flower in its first bloom - in a way that it is silly and even that makes sense. It is a story that a child would recite to you, and even when it would break your heart, you have to listen to the child. It shows the contrast in the then (pre-conflict) and the now (of the Taliban era). It narrates how the people had welcomed the Taliban and how it became the serpent that would bite them back. "How seemless seemed love and then came trouble." A professor in the university teaching poetry of Hafez and Khayyam once is now a street beggar, living in tattered clothes, scavenging for food and begging for alms. How the Taliban appropriated whatever it wanted by force or by a silly reason, and killed people under the name of ‘self-defence’, or Allah. The story has an abundance of enduring folk wisdom. It is indeed heartening to see that poetry, or wisdom doesn’t have to be commensurate with education levels. It can be earned by paying attention to things around. The story is beautiful, it takes you up on a joy ride of love, and fun that a child can feel, and it takes you to the depths of guilt, and despondency that non-confiding can bring. It paints such an appealing picture of how forgiveness comes around. "...I wondered if that was how forgiveness budded, not with the fanfare of epiphany, but with pain gathering its things, packing up, and slipping away unannounced in the middle of the night." “Write about Afghanistan, write about your Watan”, said everyone who met Amir and came to know that he was a writer, or going to be one. He said, “but I am not that kind of a writer.” And yet, this is what he had been doing all the way along, Khaled Hosseini. Cliched? How’s that for a defense?